When considering which diamond cuttings centers are the most important, odds are London won't spring to mind as one of them. The city's main role in the diamond trade has been as the major point of distribution of rough diamonds. The London Diamond Syndicate, formed in 1890 as a joint buying and selling organization for the output of the De Beers mines, was succeeded by the modern Central Selling Organization, now the Diamond Trading Company, so that most of the leading diamantaires around the world are are still obliged to make travel arrangements to London. At the same time, for almost two centuries, a small cutting industry has contrived to exist in the British Isles and the greatest diamond which it had produced was the Regent, or "Pitt" as it was then known. The largest rough gemstone handled has been the Woyie River, cut in the early-1950s by Briefel & Lemer, the same firm who had been entrusted with the Williamson Diamond. With the Vainer Briolette, London was recognized as a diamond cutting center again. 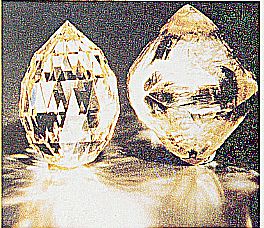 In the autumn of 1984 associates of M. Vainer Limited informed them of the existence of a 202.85-carat diamond, yellowish, slightly spotted, but of almost perfect octahedral shape. Instead of cutting the customary brilliant from such a stone Milosh Vainer and his master cutter, Michael Gould, had other more unusual ideas: they decided to cut a briolette. This is a fairly rare diamond cut. One older example was owned by Henry Philip Hope, the banker whose collection of unique gems included the famous diamond named after him. The Briolette of India, weighing 90.38 carats was thought to have a history dating back to the Middle Ages; unfortunately recent research has revealed it was cut in Paris in 1908-09. Four more briolettes, all yellowish, are the so-called June Briolette of 48.42 carats and three sold in Geneva by Christie's in May of 1984 that weighed 44.61, 32.32 and 29.17 carats. These have all been surpassed by the Vainer Briolette weighing 116.60 carats. It has 192 facets. The GIA certified that both the polish and symmetry were Excellent and that the color was Fancy Light Yellow. The diamond also enjoys, therefore, the distinction of being the largest diamond to have been faceted in London to date since the Regent, and being the second largest briolette cut diamond in the world. The first largest briolette-cut diamond weighs 180.85 carats, and is also yellow. It is privately owned. The third largest is a 114.64-carat stone, yellow as well, listed as being discovered in India, privately owned. The fourth largest is a 107.43-carat Fancy Yellow gem. It was supposedly sold at Sothebys on May 16th, 2002, but for how much I don't know. Its estimate was $600,000 - $800,000. The fifth largest is a 101.25-carat yellow, owned by M. Vainer Limited of London, the namesake of the Vainer Briolette. The Vainer Briolette was purchased by the Sultan of Brunei. In addition the rough stone yielded five smaller gems weighing a total of 14.93 carats, all of which were faceted in keeping with the historical cutting of the principal gem. Sources: Famous Diamonds by Ian Balfour, Diamond Cuts in Historic Jewelry - 1381 to 1910 by Herbert Tillander, and Diamonds - Famous, Notable and Unique by GIA.